Over 800 incredible volunteers help us bring weekly Shared Reading groups into communities across the UK. But what is it like, becoming a Reader Volunteer? Sabine shares her story. Since 2013, The Reader Organisation has been developing a Reading for Wellbeing project across South London, setting up and training volunteers to run shared reading groups all with the purpose of helping to improve the health and wellbeing of over 1,700 people living in the boroughs of Southwark, Lambeth, Lewisham and Croydon. The project was made possible thanks to a three-year funding bid by the Guy’s and St Thomas’ Charity and the Maudsley Charity, and has so far seen a total of over 70 groups meeting in a variety of settings, including libraries, health and community centres, schools – and even Tower Bridge! We’ve been reaching people of all ages, backgrounds and life situations, using great literature on a weekly basis to help improve confidence, create social networks, widen perspectives and offer a sense of belonging to those who have become especially isolated. In some cases, the reading shared has become a preventative tool for people at risk of poor health, with regular attendance at groups aiming to reduce the need to visiting a GP. “As the group gets under the skin of ‘Silas Marner’ by George Eliot, the session facilitator, Val, pauses at intervals to reflect on what’s being read and prompt conversations across the table. I can see pretty quickly why the set-up works. This group is hosted in the welcoming environment of a public library. As people gather and the reading starts, an inviting, non-judgemental atmosphere wraps around them, gathered in a corner of the library, like a protective shield. However, the true value of these encounters is in the power of the shared reading. By deconstructing the joys and perils of the fictional characters, real-life stories start to emerge around the table. Some, like Uzonna, a retired mental health nurse, remembers passages of her life as a young girl growing up in Nigeria. Others like Maria, who was referred to the group through Lambeth Hospital, enjoys the sharing of “different opinions” and how they “tend to agree at the end”. Hazel enjoys meeting all sorts of different people she wouldn’t normally. Since joining, she and others enjoy the group so much they have swapped the computer lessons they used to attend at the library for this weekly reading gathering. Read Nicola’s blog in full on the Guy’s and St Thomas’ Charity website. 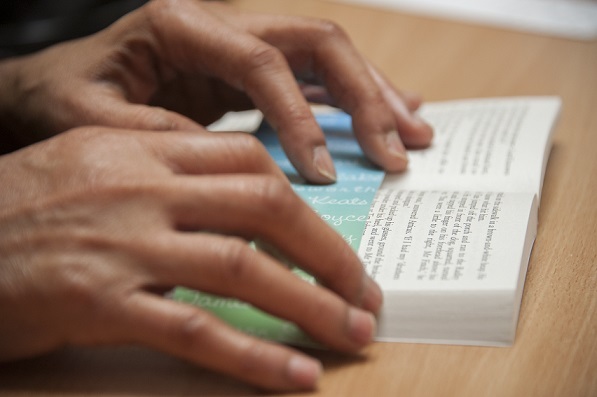 Thanks to the funding from GSTTC and the Maudsley Charity, we have been able to ensure a lasting legacy of the positive wellbeing effects of shared reading in South London. To date, over 30 groups have been taken over by trained volunteers and are proving to be sustainable, with more training planned for the future. The project also includes an ongoing research investigation which will help to determine the impact of the shared reading model on such a wide spectrum of the population at whole. Here’s to even more shared reading across South London!